When I checked out the upcoming indie puzzle-platformer Warp at PAX East earlier this year, I saw a short demo that its developer, Trapdoor, had designed to show off the game at the show with two powers, “Warp” and “Frag.” They’ve since unveiled two more, “Echo” and “Swap,” and I recently got to spend some time playing around with them. As a cutesy orange alien named Zero whom scientists have imprisoned in a well-guarded underwater testing facility, each ability at your disposal gives you only more creative ways to toy with -- or take vengeance against -- your human captors. You can fight your way out in a gleeful murderous rampage, or avoid detection while you make your escape like a ghost. Warp is one of those games with a cute, clean aesthetic that hides a rather violent, sadistic underbelly that you may or may not see. It’s easy to be charmed by Zero’s droopy-antenna ears and sympathize with his plight, but he’s not exactly helpless -- at least, not after the game’s opening. This puzzle-platformer hinges on stealth, since it only takes one bullet to put Zero down, but while you can make it through the game by slinking around and avoiding sticky situations, the ol’ “hunted becomes the hunter” path is also a viable option, thanks to Zero’s special abilities. I’ve already discussed how Warp and Frag allow you to jump inside objects and people, and then either explode outward (killing them and leaving a sizable splotch of blood in the process) or merely jump out. 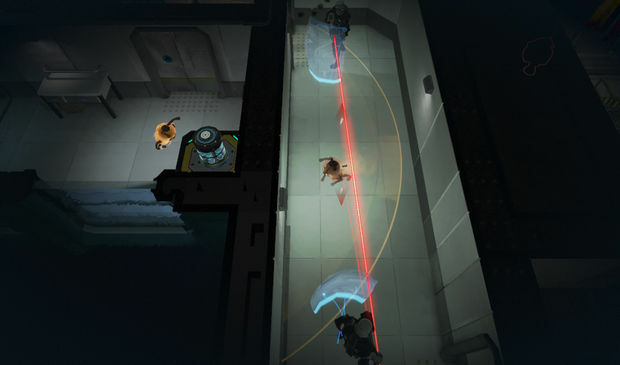 Echo and Swap can similarly be used as means to an end (solving puzzles to escape the lab) or as agents of assassination. The “Echo” power entails a bit of astral projection: he can spawn an ethereal doppelgänger and use it as a decoy. Note that I didn’t say “doppelgänger of himself” -- in fact, you can Warp into humans and create Echoes of them, too. Humans pretty much believe that your Echo is you, so if your Echo catches a guy’s eye, he’ll come and investigate -- the power is a great way to startle scientists and lure guards. The only limitation on an Echo is distance: it can’t go farther than a certain radius from your corporeal form. If an Echo gets shot, it simply evaporates and leaves your body unharmed. Zero’s “Echo” and “Swap” abilities join for a formidable tandem. Echoes can travel through walls, since they’re immaterial projections, and by pressing A, your body can instantly Swap places with its Echo. This, in effect, turns Echo/Swap into a long-distance Warp (that initial power only allows you to jump a few feet ahead). 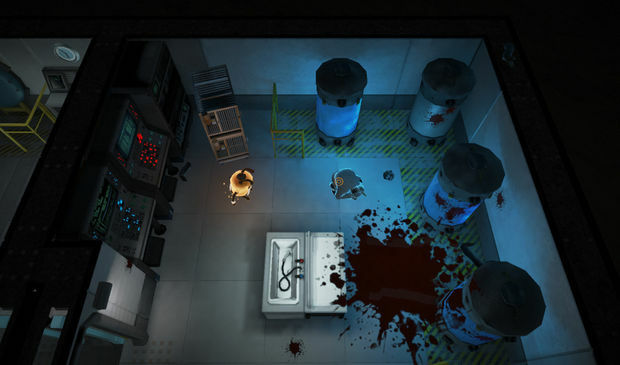 Swap also works with objects and people, a facet whose devious, blood-spilling potential was highlighted by a testing room. 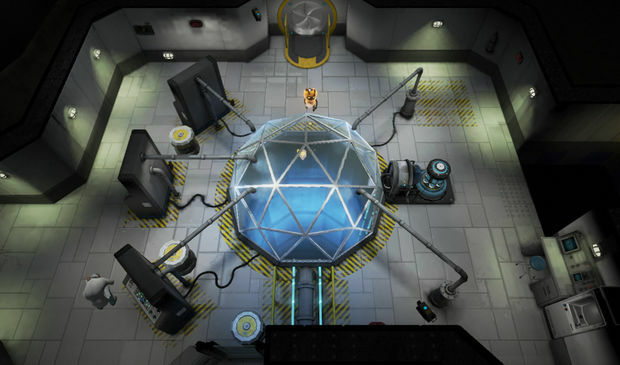 In the demo I saw, Zero came upon a room filled with chambers that scientists had clearly been using to inflict pain and suffering on test subjects. Equipped with Echo and Swap, Zero was prepared to exact a measure of revenge... and then some. He Warped into a scientist, then created an Echo of the man and crossed into a chamber that looked like something out of MadWorld: two bloody spike-bearing walls periodically slammed together, pulverizing anything unfortunate enough to get stuck between them. Once the scientist’s Echo had made its way inside the chamber, a quick tap of A sent Zero back outside, leaving the scientist to contemplate his fate for a split second before the walls crushed him into oblivion. It’s thrilling to see someone get their comeuppance with a taste of their own medicine, isn’t it? The other scientists left in the room -- meek geeks that they surely were -- cowered and scattered as the newly minted murderer approached; watching them run away from a creature half their size made the gruesome killing particularly enjoyable. Swap is also useful in solving puzzles. In one room I saw, Zero needed to reactivate a bridge by placing a large battery on a pressure plate. But since he can’t carry objects by himself, Echo/Swap are necessary to move things around. Standing on the plate, he broadcast an Echo into the battery, and then Swapped it onto the plate. 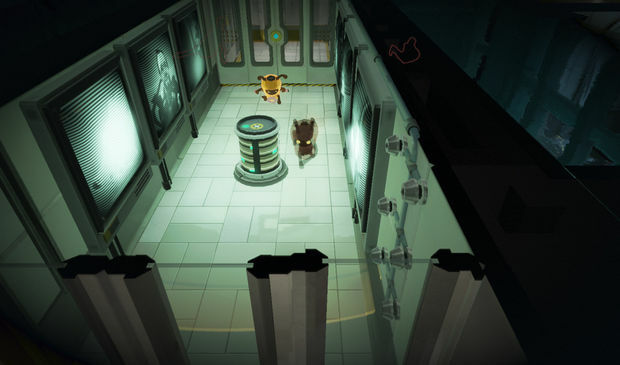 Many of Warp’s puzzles will test your intellect, dexterity, and speed, so the game also offers challenge rooms to measure your skills against other players on online leaderboards. (The developers have established the gold-medal times.) Small collectible creatures, called “grubs,” will let you upgrade your abilities -- you’ll be able to Warp silently and Frag without a bloody trace, or move twice as fast. 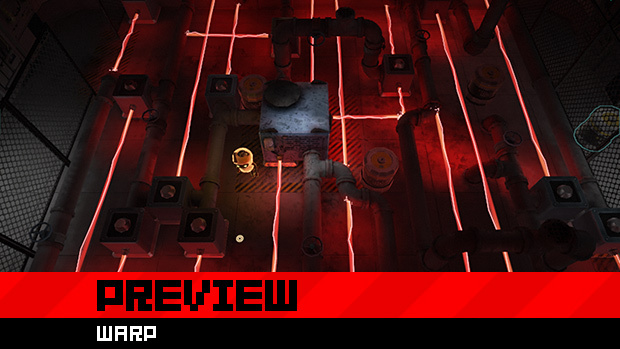 My second look at Warp only heightened my anticipation for the game, which oozes with indie charm and the right aesthetic to make its gore funny. Zero’s varied abilities let you play the game as aggressively or passively as you like; I’m looking forward to using them to help him escape his submerged prison, and mess with some of his captors’ minds -- and bodies -- in the process.